I am on a non-fiction tear! So unlike me. 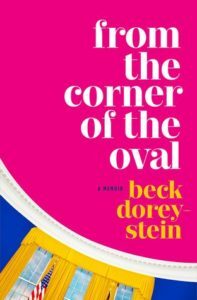 From The Corner Of The Oval by Beck Dorey-Stein is the author’s memoir about her 6 years serving as a presidential stenographer under President Obama. This is a good book for people who like dishy behind-the-scenes Washington insider perspectives, though be forewarned: it’s pretty light and spends a lot of time on her social life. In 2012, Dorey-Stein answered a Craigslist ad looking for a stenographer at a law firm at a time when she was jobless and unrooted, working a bunch of part time gigs. She missed the first interview but showed up for the second, and found out later that the job was actually working for POTUS, not for a law firm. From there she embarked on a whirlwind term-and-a-half of recording and transcribing Obama’s speeches and interviews, a job that took her all over the country and the world on Air Force One and cemented friendships with staffers in- and outside the White House. Dorey-Stein is funny, self-deprecating and observant. I really enjoyed reliving the Obama days (sigh) through her perspective, especially hearing about the days that stood out to her, for good or bad (Sandy Hook and other mass shootings; Election Night 2014; meetings with world leaders; travel to international sites like Petra). In From The Corner Of The Oval, readers get a lot of glimpses of Obama, learning that he is competitive, funny and patient, yet also sometimes testy after long days of dealing with reporters. It’s also fun to get a glimpse inside the White House, at the egos and personalities that flank the President, often unnoticed by the public. I would have liked more analysis of the Obama presidency, such as why gun reform always failed or more about Obamacare and its tortured rollout. Maybe Dorey-Stein stuck to what’s publicly available for confidentiality reasons? Either way, I would have appreciated a deeper treatment of the issues that defined the Obama terms. The political stuff comes with an almost equal dose of Dorey-Stein’s social life, including an on-again, off-again (but mostly on-again) illicit relationship with an older White House staffer with a girlfriend. The guy is basically an a-hole, but she’s completely into him and ignores the signs – again, and again, and again – that he’s not looking for something serious with her. There’s lots of drinking and “do I have any friends?” and “wow, these guys really like me” and “why don’t I have any confidence?”- nothing unusual for a memoir of one’s late 20s but a stark contrast to generally more substantive political chapters. That said, I really liked From The Corner Of The Oval and looked forward to listening to it each time I got in the car. I got caught up in Dorey-Stein’s rollercoaster social life. I gladly took in the Obama memories and appreciated her dedication to and love for her former boss – merited and deserved. And I listened with horror to her epilogue about her short stint in the Trump administration (she stayed on for two months in January 2017), which couldn’t have differed more from the six preceding years. The audio for From The Corner Of The Oval is narrated by Dorey-Stein, and I can’t really imagine anyone else doing it. She’s not the most polished narrator, but this is her story, and it all felt even more personal coming from her voice. I was always eager to turn this audio back on (the sign of a good audiobook is when I play it in the shower, which I did here) and it went by pretty quickly. From The Corner Of The Oval satisfies the memoir requirement for the 2019 EDIWTB Reading Challenge. When The Four by Scott Galloway came out last year, I knew I wanted to read it. 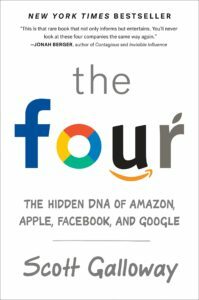 I work in technology, so this book about Amazon, Apple, Facebook and Google was right up my alley. The company I work for, Homesnap, works closely with Facebook, Google and Apple, and Amazon is, of course, Amazon, so I was interested to hear what Galloway, an NYU business school professor, had to say. Google signaled the end of the brand era… hurting Apple, who also finds itself competing with Amazon in music and film. Amazon is Google’s largest customer, but it’s also threatening Google in search. Apple and Amazon are running, full speed, into each other in front of us, on our TV screens and phones, as Google fights Apple to be the operating system of the product that defines our age, the smartphone. Galloway explains why the Four Horsemen have so quickly outperformed the traditional brands and companies – across many sectors – that were the bedrock of the American economy for decades before Facebook came along. He also identifies the few companies with the potential – but not necessarily the likelihood – of becoming the Fifth Horseman. (Think Uber, Tesla, Microsoft, Walmart). Even though The Four came out recently – October 2017 – it already feels somewhat outdated. Things have changed for Facebook, for sure, in the intervening months, and Amazon seems to have gained strength in a number of areas even in that short time. (Galloway updates The Four in this 2017 video; I’d like to know what he’d say today.) Amazon really emerges as the company to fear here. Trying to beat them is futile. If you’re an intense b-school type who lives and dies by numbers, this book might be too light for you. If you like funny, slightly irreverent books about business and technology, this one is for you! I really enjoyed it and learned a lot in the process. If you’re interested in working for one of the Horsemen, then this is required reading. I listened to The Four on audio. The format – short subsections – lends itself well to audio and I had no trouble staying focused. The narrator, Jonathan Todd Ross, was funny and engaging, faithful to Galloway’s tone throughout the book. If you like audio non-fiction, this is a good one to add to your player. Ray Kroc is best – if erroneously – known as the founder of McDonald’s. He didn’t actually start the company – the first McDonald’s was owned by two brothers in San Bernardino, CA – but Ray did develop the franchise model that turned McDonald’s into one of the world’s biggest brands, making himself a billionaire in the process. Ray’s third wife, Joan, to whom he was married when he died, gave away the billions of dollars in wealth that her husband created, and she is the subject of Lisa Napoli’s 2016 book, Ray & Joan. The first half of Ray & Joan covers the history of the McDonald’s chain, including its dusty inception, and the early, lean years of Ray’s ownership of the company. A salesman at heart, he made many missteps along the way to success, each of which is covered in the book. Joan, meanwhile, was a young wife and mother when Ray laid eyes on her in a Minnesota nightclub, playing piano and singing. She stole his heart, and while it would be many years before they were together, he never forgot about her. Ray and Joan were fiery, opinionated people who fought often but were drawn together by a passion that survived three marriages to other people. By the time the Krocs finally got together for good in 1969, Ray was already very wealthy. The causes that he chose to support were determined by his conservative political views, and Joan often felt limited in her ability to direct her husband’s philanthropy. She tolerated his purchase of the San Diego Padres and took a limited interest in his funding of business schools and various health causes. 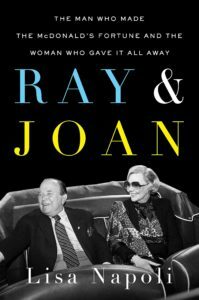 But as Ray’s health declined, and after his death in 1984, Joan began to take charge of the family fortune and kicked off what turned into a spectacular – and indiosyncratic – philanthropic career. Her first pet cause was addiction, fueled by her frustration with Ray’s lifelong drinking, and she sought out doctors and institutions who would study the disease and provide resources to other who suffered from it. From there, she moved to nuclear disarmament and end of life hospice support and a host of other causes that caught her attention. The most interesting aspect of Ray & Joan is Napoli’s coverage of what prompted Joan to give money away. She was famously private, and hated being solicited or asked for money. When she gave, she almost always did it anonymously, in large part to prevent others from approaching her looking for a similar donation. She’d see someone on the news doing something that impressed her, and the next day a check would arrive from Joan. At the end of her life, she concentrated her giving on two recipients: NPR and the Salvation Army, though the enormous gifts she left both organizations upon her death came with strings and instructions that made them almost as burdensome (especially in the case of the Salvation Army) as they were lifesaving. Napoli had a blank slate to work with, as no one had written about Joan Krok before, despite her enormous legacy. Napoli did a good job of unearthing the psychological roots of Joan’s motivations, and by the end I had a good sense of who Joan was, with all of her complications and contradictions. The book moves along pretty steadily, and it’s fascinating to track the path of Joan’s hundreds of millions of dollars. I listened to Ray & Joan on audio. It was narrated by the author, and I didn’t love it. Napoli has a chirpy voice and she enunciates VERY clearly, and sometimes that voice just didn’t match the subject matter. She’d be talking about someone dying, or a terrible tragedy, and she was just too upbeat and perky for what she was talking about, like she was reading a children’s book. Also – warning – listening to this book for 9 hours in the car as you drive around will make you crave McDonald’s, and it gets really bad if you’re at all hungry. To date, I’ve resisted the urge, but it was challenging. i enjoyed Ray & Joan and am glad I finally got to it, as it has been on my shelf for a few years. I recommend the print over the audio. 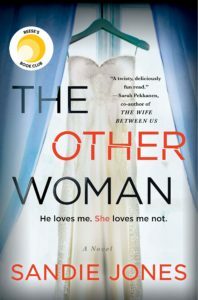 The cover of The Other Woman proclaims that it is “fiendishly clever with a twist you will not see coming”. So I am not spoiling anything by saying that there is a twist in the book. But I do not want to say much more about the plot for fear of giving anything away. Pammie is definitely a force to be reckoned with and as I read I wondered how things could possibly be resolved. Which of these two women would win out in the end? That kept the pages turning. I learned from an interview with Sandie Jones that she didn’t know where she was going with the plot when she started, that she worked it out as she went along. I can see that – the resolution wasn’t really consistent with the rest of the book and felt hastily appended. The Other Woman was a fast read and certainly kept my attention. But it’s popcorn, in the end. If you’re in the mood for an engaging psychological thriller, you might enjoy this one. I listened to The Other Woman on audio until I was near the end, when I finished it off in print. Great narration by Clare Corbett, who made Pammie just deranged enough to be realistic and communicated Emily’s insecurity and poor judgment credibly. I love those British accents! 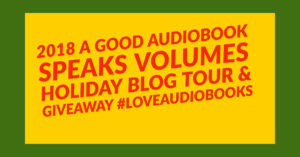 I am happy to be joining the Audio Publishers Association’s A Good Audiobook Speaks Volumes Holiday Blog Tour and Giveaway! As I have written often on this blog, I am a huge fan of audiobooks and have listened to 15 so far this year. I listen in my car during my short commute, and when I am really into a book, I’ll listen while walking the dog, making dinner, even in the shower sometimes. Listening to audio is a great way to squeeze in more books, and the experience of listening can enrich a book, lending emotional depth and immediacy. I also love audiobook narrators! They are the coolest group of people. I try not to pepper them with questions whenever I am with them, but it’s hard for me to resist. I am fascinated by the whole narration process and I always want to learn more about it. This holiday season, for some reason I’ve been in a British mood. 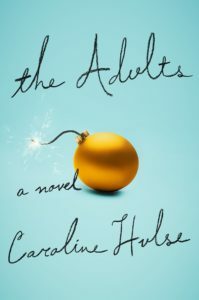 The last three audiobooks I’ve listened to were all narrated by British performers – One Day In December, The Adults and The Other Woman (still listening). British accents make characters seem smarter (more clever, as they would say) and more articulate, and I really enjoy them. This time of year is a great time for audiobooks! Many people take long road trips for Thanksgiving or Christmas, and audiobooks are a perfect way to pass the time. I get ones that my 6 year-old son will enjoy for when he’s in the car too, and he really likes them. Audiobooks are also good for trains and planes, long waits in airports, etc. Don’t leave home without a loaded phone! Do you like audiobooks too? The APA is letting me give away a fantastic selection of 8 audiobooks that have been donated by the following publishers: Beacon Press, High Bridge Audio, LA Theatre Works, Macmillan Audio, Penguin Random House Audio, Scholastic, Simon & Schuster Audio, and Tantor Audio. The books will be available for free download on Libro.fm. If you want to win these books, leave me a comment below with the name of a book that you’re hoping someone buys as a gift for you this year. I’ll pick a winner on December 8. And check out the rest of the blog tour! 29 other bloggers have written about why they love audiobooks – find out what they had to say.